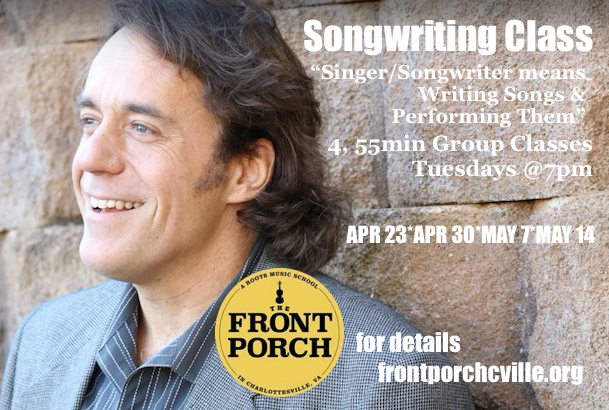 I love, love, love The Front Porch in Charlottesville and everything they have brought to the community… so I’m thrilled they asked me to do this: Conducting a Songwriting Class. This will be a group class over four weeks starting Tuesday April 23 at 7pm (approx 1 hour each session). Long before the days of recordings (cylinders, LPs, cassettes, CDs, MP3s), minstrels would travel from campfires to living rooms and perform their storytelling songs for anyone who would listen. That was the only way to hear the tunes. Recordings may exist today, but folks sure aren’t buying them. Why should they? It’s all free! Therefor, there is almost a return to the days of old, where artists really need to play live to pay the rent. Whether you want to make a dime from performing, or it’s just a hobby and passion, the singer/songwriter craft is still a fun process to learn. I have no degree in this field, nor any formal training. I’ve just been playing my original songs for audiences for the past thirty years. That’s what I know, and what I’ve learned along the way, and continue to learn, I’m happy to share with you.